You hope your children have no problem visiting the dentist, but many do. If you find yourself scheduling appointments only to realize your child is terrified of the dentist, you’re not alone. It’s a scary place for kids who don’t know what to expect, and it’s usually something you can control following the first visit. If your kids have never been to the dentist, it’s more common they fear the idea of visiting Midway Family and Cosmetic Dentistry. Here are a few things you can do to help your kids learn to enjoy visiting the dentist. The best way to manage the fear of the dentist is to prevent fear from ever occurring. 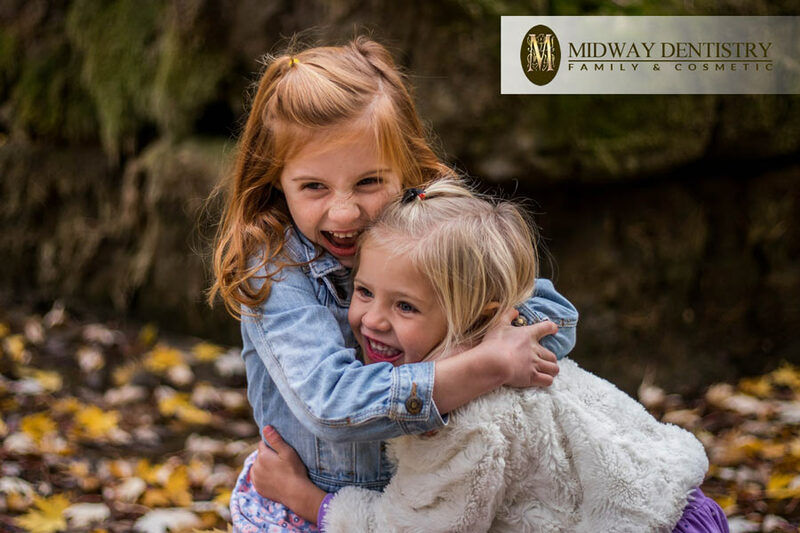 If you begin taking your children to the Midway Family and Cosmetic Dentistry offices as soon as their first tooth comes in, they’ll just remember the dentist as a fun office they’ve been to a million times before. The likelihood of them developing a fear of a place they’ve been in the past is slim. Start taking your kids to see the dentist at a young age. Tell the kids you’re going to the dentist on a certain day, and don’t make it a big deal. If they have questions, answer them with short, simple, matter-of-fact answers. Don’t make them seem like a bigger deal than they are, and don’t talk about it nonstop. If you act like it’s no big deal just like a trip to the supermarket, they are less likely to panic over it themselves. If your kids are asking about an upcoming trip to Midway Family and Cosmetic Dentistry, don’t tell them they’re getting their teeth cleaned, that it might hurt, or that it will be at all uncomfortable. Instead, tell them that the dentist wants to see their pretty smiles and check for sugar on their teeth. She needs to tell them if the Tooth Fairy is going to visit soon or if you have a bit more time to wait. You can help your kids lose their anxiety by playing dentist at home. Let them be the patient while you count their teeth or pretend to examine them. Let them do the same to you so they know that it’s all fun and games, and they also learn it’s good for them at the same time. Pretend play will make the situation seem less stressful. If your kids are really terrified of their visit, let them sit down and talk to the dentist first. There is nothing quite like a dentist who sits down and chats with kids about fun things or funny stories. This is helpful to most people who want to get their kids to calm down and focus. Your kids might feel more at ease with someone who is willing to sit down and talk to them than they are with someone they’ve never met before. Don’t cancel an appointment or walk out if the kids are misbehaving. You can’t let them win. If you leave before they see the dentist, it will only increase their dental anxiety. The best thing you can do is stay calm, keep it simple, and let them go through the experience. If kids know they can cry and get out of it, you are not in charge. The dentist can be a scary place for kids, which is why it’s important you choose a dental facility with a great staff, a friendly dentist, and an office in which you’re comfortable. Knowing they’re being greeted by someone friendly and outgoing is easier on kids than being greeted by people who are too professional, too uptight, and not much fun. Let your inner child out at the dentist and maybe your own kids will enjoy it more. Contact us to schedule your child for a dental checkup and cleaning!